Services will be held for Martinez today from 5 to 9 p.m. in El Paso. Memorial services are set for the Border Patrol agent who died while on duty last Sunday. The death of Rogelio Martinez, 36, remains somewhat of a mystery to investigators, who are offering a $25,000 reward for information in the case. Martinez leaves behind a distraught mother struggling to understand what happened to her son. “I loved him, and I miss him,” Elvia Martinez told CNN. 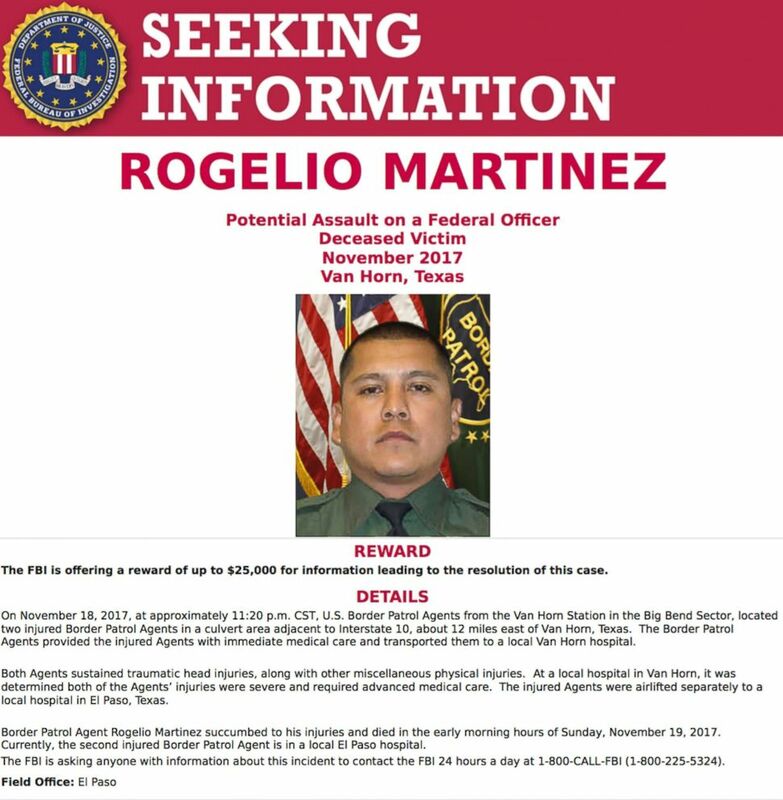 (FBI via AP) A request for information in the death of U.S. Customs and Border Protection Agent Rogelio Martinez was distributed by the FBI on Nov. 21, 2017 in El Paso, Texas. Martinez and a fellow agent were discovered at the bottom of a ravine in Texas after they had responded to a sensor triggered in the area, law enforcement sources told ABC News. The fellow agent, who has not been named, was only injured, and he has since been released from the hospital. On Monday, authorities were open to the possibility that the two agents had inadvertently slipped into the ravine because of a lack of concrete evidence, the sources said. During a press conference on Tuesday, FBI Special Agent-in-Charge Emerson Buie, Jr. said the agency was investigating the case as a "potential assault on federal officers" and appealed to the public to call in with any tips. President Donald Trump said Monday that the agents had been "brutally attacked." When asked if Trump was correct in the description, Buie said Tuesday that he had not briefed the president on the case. Texas Gov. Greg Abbott also referred to the injuries the agents sustained as an "attack." Visitation will be held for Martinez today from 5 to 9 p.m. local time at Martin Funeral Home in El Paso, Texas, with a vigil at 7 p.m. A funeral Mass will be held Saturday at 1:30 p.m. at Our Lady of Guadalupe Catholic Church.